Why Do Good Dogs Roll In Poop? My huMom told me some dogs like to roll in the poop of other animals. I’m a lady & I would never do such a thing, but I was curious why on earth a good dog would do that so I did some sniffing on the inter-webs. The most common explanation put forward is that rolling in poop is an evolutionary hangover inherited from wolves, who roll in poo to mask their scent from prey. But oddly, when given a choice, a modern day wolf will roll in the poop of a carnivore such as a cougar & will ignore herbivore poop like a cow or sheep. From a hunting aspect, that makes no sense. A theory suggests that maybe dogs roll in poop to hide their scent from larger predators such as coyotes. That would explain the preference for cougar poop over sheep poop rolling. Another theory suggests it’s a way of telling other canines where you’ve been. Sort of like saying, “come smell what I found on my walk”. Yet another theory states we might simply draw pleasure from the strong odor. 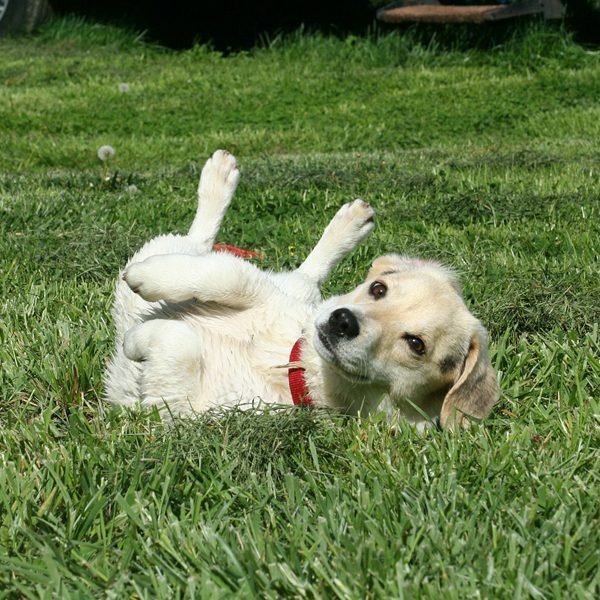 Dogs may get a rush of dopamine, a neurotransmitter involved in reward & pleasure from rolling in poop. In conclusion, a canine’s desire to rub in bad smells could be a relic from some ancestor long ago in our evolutionary past. Rolling in poop may have had a very important function at some point a long time ago. Bottom line is, no one really knows. Not even me. Does your good dog like to dab on some poo-fume? Poo-fume! BOL! BOL! The boys roll in the backyard but not in stinking stuff. Bentley did find some irresistible turkey poop at my brother’s house once though. I love rolling in goose and seagull poop!! The smellier the better!!! I can usually find some other mystery things to roll in that my humom can’t see…of course she never appreciate it because I always end up getting a bath!!! All that hard work washed away!! Grrr…. Bear loves to roll in horse/mule/deer pooh.